Think of yourself as a business. You are good at producing certain things — as a family member, friend, co-worker, employee, or employer — and you know how to go about producing those things. What you don’t know, you can learn through education, experience, and the voluntary counsel of family, friends, co-workers, and employers. But you are unique — no one but you knows your economic and social preferences. If you are left to your own devices you will make the best decisions about how to run the “business” of getting on with your life. When everyone is similarly empowered, a not-so-miraculous thing happens: As each person gets on with the “business” of his or her own of life, each person tends to make choices that others find congenial. As you reward others with what you produce for them, economically and socially, they reward you in return. If they reward you insufficiently, you can give your “business” to those who will reward you more handsomely. But when government meddles in your affairs — except to protect you from actual harm[*] — it damages the network of voluntary associations upon which you depend in order to run your “business” most beneficially to yourself and others. The state can protect your ability to run the “business” of your life, but once you let it tell you how to run your life, you compromise your ability to make choices that are right for you. * “Actual harm” consists of actions (force, verbal and physical intimidation, fraud, theft) against persons and/or their legitimate interests (family, property, business). It is the proper business of the state to defend citizens from harm, and to deter harm. The state may preemptively defend citizens from predators (foreign and domestic) who clearly intend to inflict harm, and who possess or are in the process of obtaining the means of inflicting it. A key shortcoming of statutes and regulations is that they impose one-size-fits-all rules on the behavior of individuals and businesses. Thus “helpful” statutes and regulations turn out to be unhelpful because they substitute rigid rules for the application of local knowledge and on-scene judgment to unique circumstances. The “better” way of making a left turn requires additional travel distance, and thus additional risk; two additional turns, each of which involves risk; and crossing traffic, which involves further risk (especially if the crossing is unaided by a traffic signal). Then there are the additional costs in fuel, tire wear, and time that the owners and drivers of vehicles must bear. 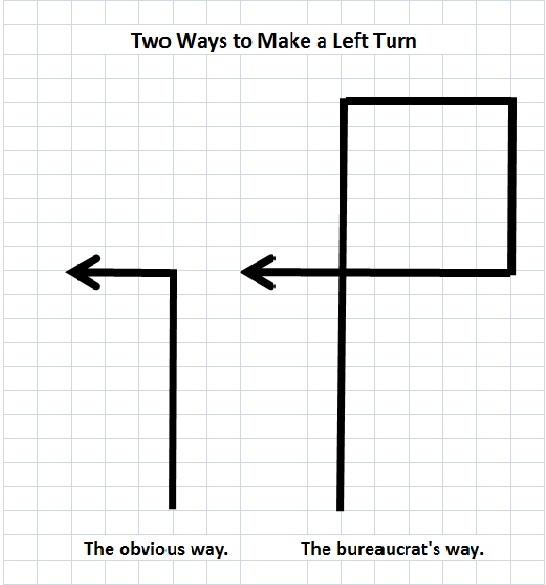 Such is the “helpful” nature of government. For more, see this post and follow the links therein. This entry was posted in Political Economy & Civil Society and tagged bureaucracy, bureaucratic rigidity. Bookmark the permalink.